Viv Lewis Caravans is a name that is well respected throughout the caravan industry. We have been repairing and selling static caravans for over 40 years and the knowledge combined with the wealth of experience gained over these years makes us one of the first choices within the trade and public sector. 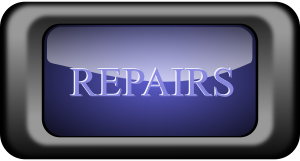 We are an authorised Arronbrook Caravans dealer and repair specialist. We cover Wales and the South of England. Our sales yard at Viv Lewis Caravans -Atlantic Way, Barry, South Wales stocks a wide range of second-hand static caravans some of which can be viewed on the used caravans page of this website, or if you prefer you can make an appointment to come and view them at our premises. If you don’t see what you’re looking for on our website or you’re looking for something unusual, no trouble, we can help! So please contact us and let us know your requirements. With our knowledge and connections in the industry, we will help you find your favoured caravan. 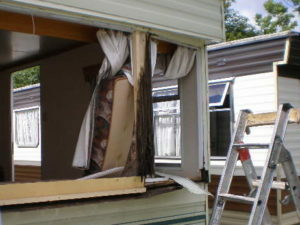 You can be certain that the caravan you choose will have been thoroughly inspected prior to your purchase, giving you complete peace of mind. In addition our caravans have been privately owned, so you can be sure that they all have been well cared for. We can also supply this year’s new ranges and the latest models of static caravans at exceptionally competitive prices. 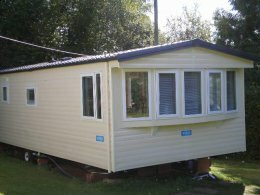 To view a few of the latest new caravans that we can offer please visit the new caravan’s page on this website. 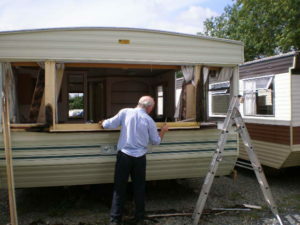 Viv Lewis Caravans also specialise in static caravan repair which takes us all over Wales and England, we also frequently travel as far afield as Ireland and France to repair and service static and residential caravans. If you would like any more information in relation to our range of services or to discuss your needs, please do not hesitate to contact us on our land line 02920 515285 or mobile 07778 197979 and one of our helpful members of staff will answer any questions you may have and provide honest and impartial advice. For other methods of communication, please use our Contact Us page.